In New Taipei, a final push is underway to galvanize voters for the mayoral elections. 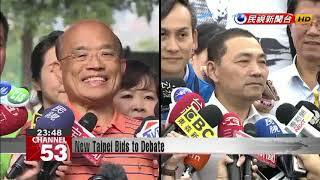 Today DPP candidate Su Tseng-chang canvassed in a park, as KMT candidate Hou You-yi unveiled 10 major campaign events. And after weeks of uncertainty over the matter, Hou has accepted Su's invitation to a policy debate, which is slated for next Monday. As the clock ticked down to Election Day, Su headed over to the Xinzhuang Sports Field in the early morning to canvass voters. He held nothing back as he spoke about how his rival refused to accept a debate invitation for 82 days. Hou You-yi is always very calculating. Because the people realized he didn’t want to debate and saw his guilty conscience and arrogance, he changed his tune. Taiwanese people are honest and kind-hearted. I did not think that debating was the best way to go, but he was so insistent on debating. I have never rejected an invitation to debate. Su got his debate, but it’s not a complete victory. He complains that he and his rival won’t have the opportunity to cross-examine one another. If you agree to debate, you ought to have more generosity of spirit. Don’t be so petty and throw up all these conditions. The fairest way to hold the debate would be to have the election commission host it. We are going to follow their rules. Su questioned his rival’s motives for wanting the election commission to host the debate, saying Hou had a political alliance with the head of New Taipei’s election commission. Well before the start of the debate, Su is already warming up for a fight.